This post is for those people whose web hosting company uses the 'cpanel' to manage their sites. Most of the popular ISPs use cpanel including Bluehost, Hostgator and Justhost. When you log into your web host, you are automatically taken to their cpanel. In the Files section of the cpanel, there is an option (icon) called Backup Wizard. When you click on the icon, you are presented with two options, namely Backup or Restore. Yacapaca can be used to help in the Controlled Assessment aspect of subjects. A subject teacher simply creates a portfolio within Yacapaca which provides the students with an area to upload their files (max 15M per file). 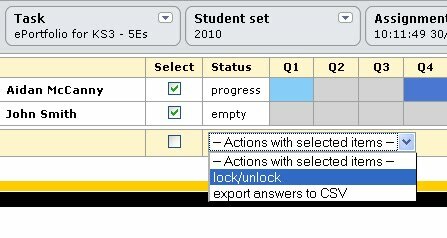 The teacher locks their portfolio by selecting the 'Actions with selected items', then 'lock/unlock' as shown above.